The Ross Letterbook, which deals with operations at his Oxford Iron Works in Campbell County, Virginia, during 1812 and 1813, gives a remarkably full picture of slave working and living conditions at this installation and offers insight into a number of key topics, including the status of the black family in this industrial setting, the nature of the relationship between the ironmaster and his bondsmen, and the application and effectiveness of the employer’s various disciplinary and incentive techniques. Ross’s feelings toward his skilled slave artisans are most clearly revealed in his relationship with Abram, the Oxford founder. Ross considered Abram an exceptionally able iron worker, but his regard for him seems to have gone beyond simply an admiration of his abilities. Dr. Charles B. Dew is currently the Ephraim Williams Professor of American History at Williams College in Massachusetts. He is the award-winning author of several books including: Apostles of Disunion: Southern Secession Commissioners and the Causes of the Civil War, Bond of Iron: Master and Slave at Buffalo Forge, and Ironmaker to the Confederacy: Joseph R. Anderson and the Tredegar Iron Works. His study of Central Virginia iron works started over thirty years ago. 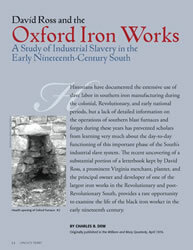 This article, David Ross and the Oxford Iron Works: A Study of Industrial Slavery in the Early Nineteenth-Century South, was originally published in the William and Mary Quarterly of April 1974. Permission to reprint was granted by the Omohundro Institute of Early American History and Culture.